To my mind there's 2 types of salmon in any river at any one time. Firstly there's the 'easy' fish and secondly there's the 'difficult' fish much the same as kids! If you're fortunate to be fishing a salmon pool jammed with alert, reactive, oceanic hunting head still on 'newcomers' then the reality is that (even if a few hooking opportunities are squandered) a blind dog in a snow storm is going to catch one or two of them at least! Call yourself a salmon fisher if you want but to my mind you'll still not have passed the real salmon fishing test! The 'difficult' resident fish in the pool that will gladly and often 'annoyingly' show themselves but have completely 'switched off' from investigating a salmon fly are a different proposition and need very careful handling if success is to be achieved. If you're trained only to catching the 'easy' fish with the normal fly fishing tactics then you need to shift into a different gear to have half a chance with these educated salmon. To keep fishing in the same style that these older fish are not responding to is a complete and 'illogical' waste of time and will only educated these fish further! This creates a great opportunity for salmon anglers to think about how they are going to catch 'not so easy' resident salmon on the Scottish rivers until the river management bodies are announcing 'meaningful' annual wild smolt output figures via smolt ranching techniques which have been proven with great success in Scotland and many other areas of the world over the last century and longer! In the meantime anglers should make an effort to become 'fully' tuned in as overall from what I've seen the vast majority are not. 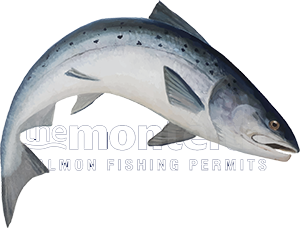 Most anglers unfortunately do not get the opportunity to fish and hone these salmon fishing skills as often as needed for these to be developed or simply have not been shown the differing approaches for catching tricky resident salmon. I'm not talking here about a beautifully presented long range fly line as to my mind while lovely to see that's just the entry ticket to the carnival which doesn't get you a free pass for the dodgems! The way to catch difficult salmon is to firstly stop and think! What's the point of swinging the same 'repetitive' fly patterns 6 feet over resident salmon's heads over and over again hoping one is going to break silence! It's not going to happen but understand if you can place any salmon fly into that magic square foot of water directly in front of even a difficult salmon's nose there's a real chance that fish is going to at least have a 'bang' at the fly. If you can achieve the above thought process and add different angles of 'psychology' to that approach like going much smaller or bigger in fly pattern with some added nudges, dunts and sharp draws to the swing profile of you salmon fly then all of a sudden you'll find these difficult salmon are not as difficult! While you're pursuing the targeting of 'difficult' salmon there's also the added possibility that an 'easy' fish will quietly enter the pool and that fish is always likely to be a self identifier! Target the 'difficult' salmon and get your thoughts 100% sub surface and become a highly effective salmon psychologist!